Cienfuegos is a port of call on Cuba cruises. The People to People Cuba cruise program on the Celestyal Crystal cruise ship includes a tour of Cienfuegos, but many cruisers take an optional full-day tour to Trinidad. Cienfuegos is a city of 150,000 and more than just a gateway to the more famous tourist town of Trinidad. Those on the tour of Cienfuegos gave it good marks, and the city has a lovely tree-lined malecón and a historic colonial downtown area that has earned UNESCO World Heritage Site status for its 19th-century design. In addition to being younger than many Cuban cities, Cienfuegos has a different atmosphere because it was founded in 1819 by French immigrants from France and Louisiana. Many of the streets still have French names. The city is not named for the Cuban revolutionary hero Camilo Cienfuegos, but for a Captain General of an island with the same name. Like Trinidad, Cienfuegos is a major agricultural city that flourished in the 19th century. Having one of Cuba's best harbors added to the city's wealth and importance. In its Punta Gorda district, Cienfuegos still has many palatial homes dating back to the late 19th and early 20th centuries. Trinidad is one of the best-preserved colonial cities in the Americas. Although the history of this Cuban city dates back to 1514, Trinidad's wealthiest period and most of its historic buildings are from the late 1700s to the late 1800s when sugar was king. Because of these many colonial structures, Trinidad has been a UNESCO World Heritage Site since 1988. 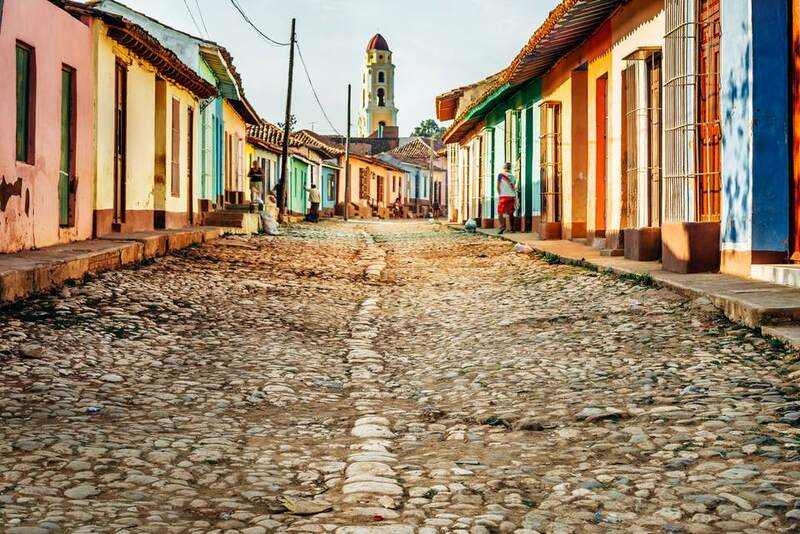 Trinidad is located on the south-central coast of Cuba, less than 10 miles from the nearest beach and less than 15 miles from the Escambray Mountains. However, as noted above, cruise ships dock at the city of Cienfuegos, which has one of Cuba's best natural harbors and is about 50 miles (83 km) northwest of Trinidad. Driving time is about 1.5 hours each way, but the road is scenic, passing through many tobacco and sugar cane fields, with great mountain and sea views along the way. After visiting the two major metropolitan areas of Santiago de Cuba and Havana on a cruise ship, seeing some of the Cuban countryside is a pleasant alternative. The bus leaves the cruise ship docked in Cienfuegos about 8:30 am and arrives in Trinidad about 10:30 am. The drive is scenic and interesting. It's nice to see some of the Cuban countryside. After about two hours on a bus, most shore excursion participants are ready for a break before beginning their walking tour. This one is no different, and the first stop at this pottery shop has a clean toilet and shopping opportunities. Like many towns with tourism as a major industry, pottery making is a popular art in Trinidad. This potter made the lovely pottery shown in the next photo. This pottery shop in Trinidad had many different types of pots. These black and white, very modern ones are an interesting contrast to the old colonial city. After about 30-45 minutes at the pottery shop, the guests reboard the bus for the short ride to old town. The rest of the tour is on foot. Old town Trinidad is filled with narrow streets, so cruise ship guests arriving by bus take a walking tour of the city. Most tours start in Plaza Mayor, the central square, and the walking tour shown in the next 10 photos takes about two to three hours. One of the first things many visitors notice are the streets of Trinidad, which are narrow and lined with pastel colored retail buildings and homes. These streets are reminiscent of Antigua, Guatemala, which was also built by the Spanish in the early 1500s. Like most Spanish cities, Trinidad has a large central square named Plaza Mayor. The square is surrounded by colonial buildings in pastel colors, and the streets are topped with very uneven cobblestones. Wearing sensible walking shoes is a must for touring Trinidad since cars and buses are not allowed on most of the narrow streets. The next three sides show buildings surrounding Plaza Mayor that were built in the 18th and 19th centuries when Trinidad was its wealthiest due to the sugar and slave trade. Guides provide information on all of these buildings when on a walking tour. The tour group arrives at the central square about 11 am, walks around the old city for about 2.5 hours, and then has lunch at about 2 pm in an old historic building. At the top of Plaza Mayor in Trinidad is the Church of the Holy Trinity (also called Iglesia Parroquial de la Santísima). Construction of this church was completed in 1892. One of the interesting features of the church is a wooden statue of Jesus called, "The Lord of the True Cross". This statue was originally being carried from Spain, destined to be in a church in Veracruz, Mexico. The ship carrying the statue had to take safe haven during a storm and then had turn back to Trinidad three times because of sudden bad weather. It was only after it off-loaded the statue that the ship sailed safely on to Veracruz. Residents of Trinidad consider these storms divine intervention and proudly display the statue in their own church. The Museo Romantico is housed in the building on the right side of the photo and is just off the Plaza Mayor. This building is also known as the Palacio Brunet, named for the wealthy sugar baron, Conde de Brunet, who lived in the palace from 1830 to 1860. Today, it is a museum houses a collection of glass and porcelain pieces, artwork, and antique furniture from the estates of Brunet and several other wealthy citizens of Trinidad. The green and yellow bell tower of the Convento de San Francisco de Asís is one of the most photographed buildings in Trinidad. Built in 1813, the building started as a Franciscan monastery, but also served as a parish church and a jail. Most of the original buildings were torn down in the 1920s. Today the buildings that remain house the National Museum of the Struggle against Bandits (isn't that a great name). This museum is dedicated to the revolutionary forces ("bandits") of the late 1950s who hid out in the Escambray Mountains near Trinidad and caused many problems for the region in their attempts to destabilize the country. The Museum of Colonial Architecture is on the Plaza Mayor and features architectural and interior decorating details from the periods of the 18th and 19th centuries. The building was once the home of the Sanchez Iznaga family. Trinidad has many shops selling local handicrafts, and it also has this street market next to the Municipal Historical Museum. This museum is interesting, but the best part was taking the narrow steps to the top of the tower in the photo above. This tower provided wonderful views of Trinidad, the sea, and the nearby mountains. The Municipal Historical Museum is housed in the former mansion of the Burrell family, who owned the property from 1827 to 1830. It was later owned by German plantation owner Dr. Justo Cantero (originally Kanter), who may have obtained his plantations and wealth through nefarious means. It is thought that he poisoned a rich slave trader and plantation owner and then married his widow. Soon after their marriage, his new bride also died a mysterious death, leaving her groom a wealthy man. The Municipal Historical Museum has many historical pieces, but the best part is taking the very narrow stairway to the top of the tower. The next two photos show the views from the tower. This photo taken from the tower of the Municipal Museum of Trinidad shows how compact the city is. None of the houses have yards, although the former mansions have courtyards. This view is out towards the Caribbean Sea, which is less than 10 miles away. This photo taken from the tower of the Municipal Museum of Trinidad shows the narrow streets of the city, the pastel buildings, and the red-tiled roofs of the houses. The Escambray Mountains are in the distance. Not all the colonial buildings in Trinidad have been well maintained or preserved. This Church of Santa Ana was built in 1812 and may have been lovely at one time, but today it is just a shell. The walls of the church look very fragile, and it wasn't surprising to find the doors locked. The Cuba cruise tour group enjoyed a late lunch buffet at the Santa Ana restaurant in Trinidad. Buffets are always good for large groups, and it is nice to sit down after walking on the cobblestones for a while. The building where the restaurant is housed was once a 19th-century prison. Following the lunch, the guests board the buses for the ride back to Cienfuegos where their cruise ship awaits them. They are back on the Celestyal Crystal by 5:30 pm. Where's the Best Diving and Snorkeling in Cuba? How to Fly to Cuba From the U.S.